Data and graphs presented in Economic Survey of Pakistan 2014-15 show that the country has fallen considerably short of achieving UN Millennium Development Goals 2015 (MDG 2015), a set of goals agreed by UN member nations in the year 2000. Key MDG 2015 goals included: halving extreme poverty and hunger from 1990 levels, reducing by two-thirds the child-mortality rate and slashing maternal mortality by three-quarters and achieving universal primary education. Economic Survey of Pakistan 2014-15 Education Report also shows that the country was poised to achieve MDG goals in years 2001-2008 during President Musharraf's rule. Then came "democracy" in 2008 and human development progress dramatically slowed down. Who's to blame for this dramatic slowdown in the nation's human development? Who gave it a low priority? Zardari? Peoples' Party? Sharif brothers? PML (N)? PML (Q)? Awami National Party? Muttahida Qaumi Movement? The answer is: All of them. They were all part of the government. In fact, the biggest share of the blame must be assigned to PML (N). Sharif brothers weren't part of the ruling coalition at the center. So why should the PML (N) share the blame for falling growth in the nation's HDI? They must accept a large part of the blame because education and health, the biggest contributors to human development, are both provincial subjects and PML(N) was responsible for education and health care of more than half of Pakistan's population. Why is it that "democratic" governments fail to deliver on human development? Is it just a matter of allocating insufficient funds? Or is it poor governance? Corruption? The answer is "all of the above". Ghost schools that exist only on paper are quite common, especially in Sindh, according to multiple credible reports. The funds allocated for building and staff salaries of these ghost schools are siphoned off by politicians and bureaucrats. Where school buildings do exist, the teachers draw salaries but are often absent. Such teaching positions are filled by untrained people in return for bribes. Many of these allegations against predecessors have been confirmed by by Sindh Education Minister Nisar Kuhro. Actions of Pakistani politicians of all parties are discrediting democracy and endangering Pakistan's future. They are their own and the country's worst enemies. They must find a way to deliver on socio-economic development to restore ordinary Pakistanis' faith in democracy before it's too late. The data shows that literacy remains higher in urban areas (74 per cent) than in rural areas (49 per cent), and is more prevalent for men (81.0 per cent) compared to women (66.0 per cent) in urban areas. Province wise data suggests that Punjab leads with 61 per cent literacy followed by Sindh with 56 per cent, Khyber Pakhtunkhwa with 53 per cent and Balochistan with 43 per cent. Gross Enrolment Rates (GER) referred to the participation rate of children attending primary schools divided by the number of children aged five to nine years. GER at the primary level excluding Katchi (prep) for the five to nine years age group at national level during 2013-14 recorded at 90 per cent as compared to 91 per cent in 2012-13. This decline is largely due to stagnant allocations at 2 per cent of GDP; shortage of schools especially for girls in remote and far flung areas; shortage and absenteeism of teachers; lack of trained teachers, especially female teachers; missing facilities such as water, toilets and boundary walls; weak supervision and monitoring; and a host of factors such as conservative and tribal culture; insecurity and lawlessness; and poverty, compelling a large number of children to work rather than to attend school. A cursory look at the table GER indicates that the only Punjab has shown significant performance by achieving Primary level GER at 100 per cent against 98 per cent in 2012-13, while other provinces have performed negatively i.e. Sindh GER declined to 76 per cent in 2013-14 against 81 per cent in 2012-13 and Khyber Pakhtunkhwa also declined to 89 per cent in 2013-14 against 91 per cent in 2012-13, while Balochistan GER also declined from 67 per cent in 2013-14 as compared to 73 per cent in 2012-13. Pakistan’s literacy rate has sustained at 58% over the past two years and the country looks set to miss the millennium development goal (MDG) for education. The Pakistan Economic Survey 2014-15 unveiled on Thursday stated that the literacy rate has gone down by 2% in 2013-14 as compared to the previous year when it was 60%. However, the survey, which uses data from Pakistan Social and Living Standards Measurement (PSLM), appears to have either quoted the figures wrongly or the numbers have been fudged intentionally. While the overall literacy rate for 2012-13 has been shown at 60%, it is actually 58% in the PSLM data. The figures are alarming as under the United Nation’s MDGs, Pakistan was required to increase its literacy rate to 88% by 2015. 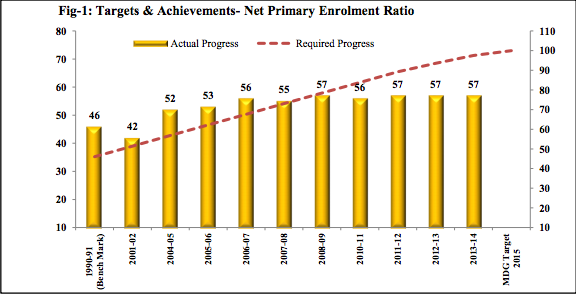 The net primary enrolment ratio, which should have been 100% by the end of this year, has remained constant at 57% since 2011-12. Despite spending slightly over 2% of its budget on education, the government could not improve the education sector with the poor performance of Sindh and Balochistan governments standing out. While the Punjab and Khyber-Pakhtunkhwa (K-P) governments managed to improve their literacy ratios, Sindh and Balochistan could not even maintain their previous rates. Punjab improved its literacy rate by one percent from 60% of the previous years to 61%. The survey incorrectly says the rate in Punjab was 62%. In K-P, increase in female literacy rate gave the overall rate a boost of 1%, taking it to 53%. Sindh witnessed the worst scenario as the literacy rate dropped by 4% in the province, from 60% to 56%. In Balochistan, the rate fell by 1% to 43% from 44% last fiscal. The survey put it at 46% instead of 44%. The country’s overall female literacy rate also came down by 1% from 48% in 2012-13 to 47% in 2013-14. The figures suggest there is still a long way to end gender disparity in education, as the male literacy percentage stood at 70% like previous years. In Punjab, the female education percentage witnessed a decline of 2% from 54% to 52% from 2012-13 with the male literacy rate pegged at 71% in both years. In Sindh, the female literacy rate was 43% compared to 47% of the previous year. Male education in Sindh witnessed a decrease in percentage from 72% to 67% as compared to 2012-13. In K-P, the female literacy percentage increased to 36% from 35% with the male percentage sustaining at 72% in both years. Balochistan leads the provinces in female literacy figures with an improvement of 2% to 25% from 23% of the previous year. I always see that you praise Musharraf era for spectacular "development in GDP, Human development index improvements" etc. But you need to realise that the figures were bloated and so are the figures from later governments. The GDP data show Pakistan moving closer to India (maintaining about 30% below India all the time), where as the growth rates are half of India's. Practically Pakistan's GDP should be below 50% of India's right now. Just shows how cooked up figures provided by Pakistan is all these years. Reality is something else. 19640909rk: "But you need to realise that the figures were bloated and so are the figures from later governments"
I would believe you if the government figures were not supported by private industry reports from 2000-2008 on a variety of things ranging from autos to cement to electronics and FMCG consumption data and employment data. But that is clearly not the case. For example, cement consumption more than doubled; auto sales quadrupled, and telecom business saw an unprecedented boom, and savings rate increased and FDI soared to over $5 billion a year. I agree, democracy is overrated. From a classical liberal point of view, an enlightened monarchy or dictatorship can solve the problems of governance as well as if not better than so-called "democratic" countries. Unfortunately, dictators do not always have the wisdom to keep within their limits. Pakistan, Nepal and Bangladesh outpaced India in poverty reduction targets in MDG 2015s. As the deadline for meeting the Millennium Development Goals (MDGs) looms, India can draw satisfaction, albeit tinged with a measure of disappointment, from its performance. It achieved 11 out of 22 parameters and is on track to meet one more by the end of the year. As a new millennium dawned, India and other countries pledged their peoples better lives. However, millions of Indians continue to live in abysmal living conditions and suffer unimaginable hunger and hardship. India dashed their hopes by underperforming on several MDGs. Countries with fewer resources managed to do better. India must draw inspiration and ideas from them. World leaders will be adopting a new set of transformative and universal Sustainable Development Goals as a part of the Post–2015 Development Agenda at the UN General Assembly in September 2015. India must take the pledge it makes at this meeting seriously. It is being given another chance to redeem its unfulfilled promises to its people. Pakistan has welcomed the International Monetary Fund (IMF) and multilateral development banks’ (MDBs) agreement to jointly provide $400 billion in order to attain sustainable growth in the world. The funds will help less developed countries achieve sustainable development goals (SDGs) over the next three years, said a press release issued by the Ministry of Climate Change on Sunday. “Massive financial support for developing countries like Pakistan will be required to meet the historic challenge of achieving the SDGs. However, any financial support by rich countries for the poor countries regarding SDGs implementation would merit appreciation,” Minister for Climate Change Mushahidullah Khan said in the statement. The announcement by the financial institutions — the African Development Bank, Asian Development Bank, European Bank for Reconstruction and Development, European Investment Bank, Inter-American Development Bank, World Bank Group (referred to as the MDBs), and the International Monetary Fund — has come in the lead up to the United Nations’ third international conference on ‘Financing for Development’, which will be held in Addis Ababa, Ethiopia, from July 13 to 16. At the international conference, governments are expected to work out as to how this new vision of SDGs will be financed and where will the money come from to turn aspirations into reality. Several heads of states, ministers, and special representatives will attend the summit. Having run from 2000 to 2015, the eight UN Millennium Development Goals (MDGs) are expiring this year in September and are being replaced by a new set of 17 UN Sustainable Development Goals at the start of 2016, which together aim to drive development efforts around the world. Running from 2016 to 2030, the proposed SDGs aim to “end poverty in all its forms everywhere” and include broad topics such as hunger, health, gender equality, education, water and sanitation, energy, economic growth, sustainable consumption and production, climate change, biodiversity and marine conservation. In September this year, world leaders will meet at the UN headquarters in New York to agree on SDGs, which is being described by development experts as an ambitious new development agenda. Khan cautioned that attaining SDGs in developing countries including Pakistan is less likely because of their weak economic conditions, many of which are still struggling to recover from massive economic damages due to devastating climate change-induced disasters. “Of course, money required for meeting SDGs in poor countries should come primarily from domestic resources and private resources. But massive chunks of such money will have to come from developed countries, who have exploited natural resources in an unsustainable manner over last several decades,” he said. The minister stressed that SDGs are an ambitious development framework and demand equal ambition in using the billions of dollars in current flows of official development assistance and all available resources to attract, leverage and mobilise trillions of dollars in investments of all kinds — public and private, national and global. The minister said that global development experts estimate that 2-3 trillion dollars of additional investment will be required by developing countries for implementation of the new 17 development goals over the SDGs’ lifetime from 2016 to 2030. The proposed SDGs to be attained by 2030 aim to “end poverty in all its forms everywhere”, and include broad topics such as hunger, health, gender equality, education, water and sanitation, energy, economic growth, sustainable consumption and production, climate change, biodiversity and marine conservation. Lijian Zhao, a Chinese diplomat, says China is all too aware that Pakistan needs more than just big-ticket infrastructure if it is to flourish. Disarmingly, he praises the efforts of Britain and other countries to improve Pakistan’s “software”, such as education and the rule of law. “But China’s expertise is hardware,” says Mr Zhao. 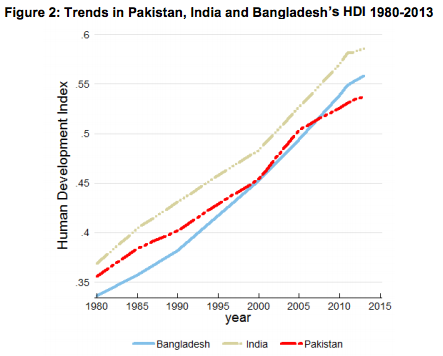 Table 2 of Human Development Report 2016 shows that Pakistan's HDI grew at an annual growth rate of 1.55% in 2000-2010, much faster than 1.09% in 1990-2000 and 0.95% in 2010-2015. 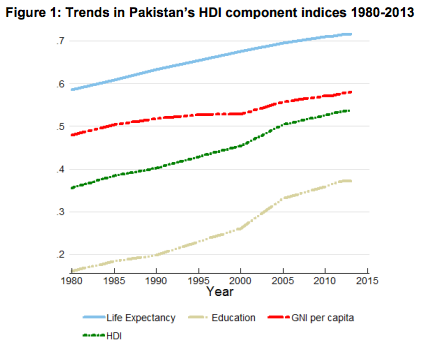 Pakistan's overall HDI growth rate from 1990 to 2015 as 1.24, slower than India's 1.52%.